Dirty little secret: this was my first-ever Morro and Jasp show. For all their well-loved Fringe-Fest Adventures and Dora-award-winning escapades, the stars have just never aligned. Jeez, I’ve been missing out. Morro and Jasp: 9-5 will scratch itches you didn’t even know you had, pulling surprisingly hard targets out of unexpected places and consistently nailing them, all in a neatly-wrapped 70-minute package. And there’s beer, if that’s your thing. The studio in the basement of the Factory Theatre has been turned into JMI Industries. (“Where the Future is To-Morro!”) And in their workplace, CEO Jasp (Amy Lee) and More-Or-Less Willing Underling Morro (Heather Marie Annis) welcome the new employees (us!) to our first day at work. Jasp is bossy but competent; Morro is well-meaning but hapless. And between the two of them, they struggle to devise a product, manufacture it, market it, and sell it to a group of unexpected investors. As they do so, they go after gender, capitalism, the modern workplace, the CBC’s last remaining cash cow, and even work in some classic I Love Lucy for good measure. Lee and Annis work so well together that it’s scarcely worth breaking them up. Suffice it to say that, between them, they made the audience spill two drinks, burst into tears, cringe, groan, smile and damned nearly piss themselves with laughter. Given the nature of clowning, I’m not sure how much more I can say without spoiling half of the fun — but there sure is a lot of it. I will caution you not to be put off by the somewhat-slow start, and to pay careful attention to trivial details: the director (Byron Laviolette) sure loves his brick jokes. If Morro and Jasp Do Puberty — due for a revival at this summer’s Fringe Festival — is half as clever, insightful and biting as 9-5, I’ve definitely got good things in my future. And if you buy a ticket, so do you. Single tickets run from $35 to 45 with some discounts available, see website for details. Tickets can be purchased online or by phone, or in-person from the box office. This venue is small, and advance purchase is recommended. Be advised that entering this venue involves climbing and descending several flights of stairs, and that blinking lights are used in this performance. Although the content of Morro and Jasp: 9 to 5 is appropriate for all ages, the subject matter may not be of interest to young children. Recommended for ages 12 and up. 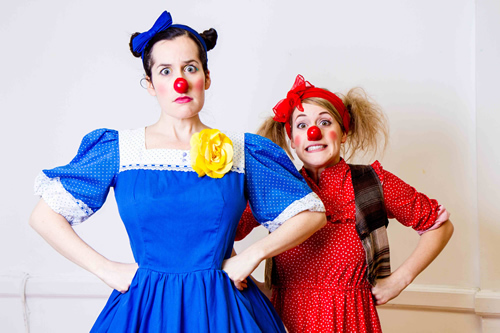 Photograph of Amy Lee as Jasp (blue) and Heather Marie Annis as Morro (red) by Trevor Haldenby.